As we walked up to the entrance, Namine was amazed at the giant gator mouth. “Are we going in there?” She was, to borrow a word from My Little Pony, nervicited. 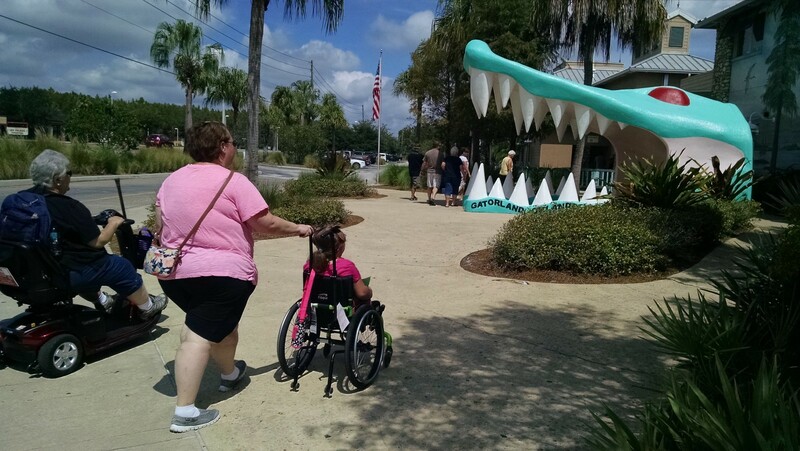 Gatorland is essentially a boardwalk circling gator-infested waters. 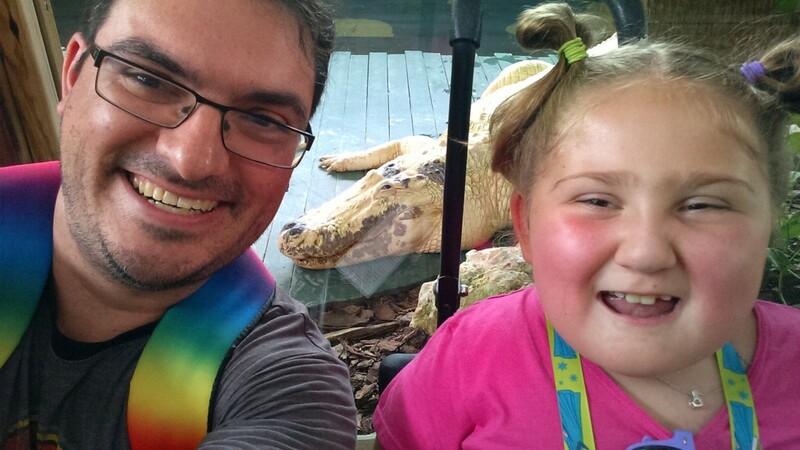 There were large and small alligators — Namine liked the baby ones the best. We saw several of the large ones cooling themselves by opening their mouths. 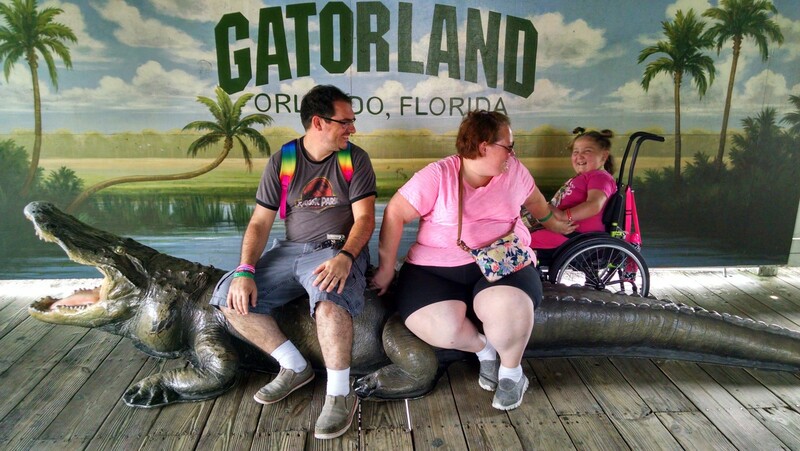 There was a large gator — not a real one — that Jessica and I sat on. Its back was a little too bumpy for Namine, but she thought it was funny that we were sitting on it. Namine’s main reason for wanting to come to Gatorland was to hold a baby alligator. When the moment came, though, she did not want to do it alone. 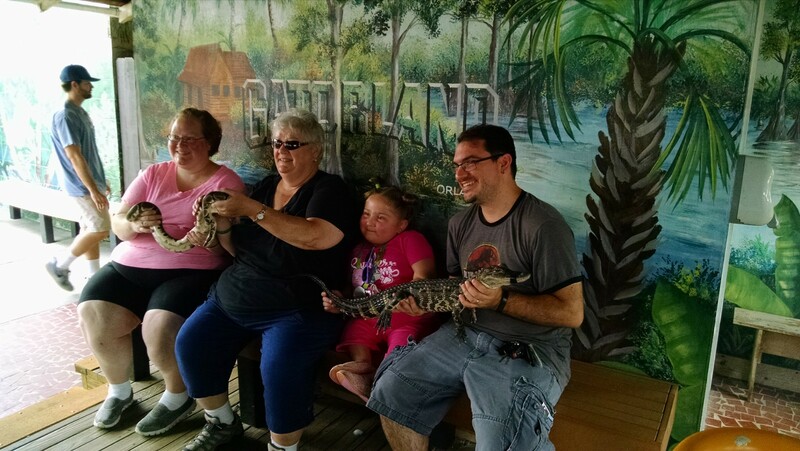 So we all got in on the photo: Jessica and my aunt held a snake (which neither of them were too thrilled about), and Namine and I held the gator. After holding the gator, we walked around some more. We saw snakes in glass cages and read all about the many poisonous varieties of snakes that Florida holds. Not all the alligators were in the open areas, either. The particularly aggressive ones — especially the white ones — were behind glass, as well. We caught the tail end of a gator wrestling show. Namine was speechless at that.